The Maine coastal town of Damariscotta holds a 10-day pumpkin festival every October, during which pumpkins of all shapes and sizes are celebrated. There is a giant pumpkin contest and parade, pumpkin art, pumpkin pie eating, a pumpkin derby, a pumpkin regatta and a giant pumpkin drop that involves a junked car and a 180-foot crane. This year’s giant pumpkin weighed in at 1713 pounds. That’s a lot of pumpkin! It begs the question: Where do all those pumpkins go when the fun is over? After the festival, pumpkins are given to local pig farms as feed, and seeds are harvested and dried from the prize winners to keep the lineage of particularly stellar pumpkins intact. Where the pumpkins don’t go is to the landfill. In Runaway Pumpkin, Daisy faces a similar pumpkin conundrum: What to do with so many pumpkins after the “Biggest and Most Beautiful Pumpkin Contest?” Her fellow contestants, decked out in costumes and ready to celebrate Halloween and giant gourds, move to throw away their pumpkins. Daisy and her friends have a better idea. Come October pumpkins abound, adorning our front stoops, windows, tabletops and yards, whole or as jack-o-lanterns. If you have a garden like Daisy, they may even be growing in your backyard. We love our pumpkins! Pumpkins can be a classroom staple, too, but not only as a decoration. Just as the apple is an opportunity to talk about seeds, the ubiquitous pumpkin is a window into the waste we create, especially around holidays. First, a few fun facts about pumpkins. This bulbous fruit is a squash and member of the gourd family. It is native to the southwestern part of North America, stretching down into Central America, and comes in a range of varieties. Most pumpkins we buy are used for decorations, though many varieties are edible. Pumpkin pie, anyone? Your students are likely most familiar with the bright orange, round pumpkin, but this gourd actually comes in an impressive array of shapes, sizes and colors. Do you talk to your students about what they like to do with pumpkins at Halloween? They may think of roasting the seeds for a snack, decorating a pumpkin with paint, or helping to carve a pumpkin into a Jack-o-Lantern. (As an educator looking to fuel your day, your mind may wander to a pumpkin-spiced latte.) Tasty eating and good fun! You might also ask your students what they do with the pumpkins after Halloween. How many of them answer, put them in the trash? They aren’t wrong. Most of the 1.3 billion pounds of pumpkins produced in the United States every year wind up in a landfill, according to the Department of Energy. These pumpkins join the other organic waste put there, which is bad news for the environment and the climate. Food waste is a complex issue for this age group. Young children are just beginning to learn about appropriate-sized food servings and the potential consequences of not eating their vegetables! Enter the pumpkin as an age-appropriate ambassador for the larger food waste problem. What follows are suggestions for alternatives to throwing them into the trash (some of which are also appropriate for any organic matter). We need to start early to help students feel empowered. On November 1, with bellies full of candy, it’s time for your pumpkin to move on. If your school has a garden, consider designating a section of it as next year’s pumpkin patch, and place a few Jack-o-Lanterns in the space. This gives you an opportunity to observe over time how a once living thing decomposes. Your students will enjoy watching the carved faces and scary expressions slowly sag and change as the pumpkins lose their shapes. Students can take photos or draw the pumpkins once a week to create a timeline for the decomposing. How long does it take for the pumpkin to no longer be recognizable? What do students think will happen to the seeds? And in the spring, you can all look to see how many pumpkin seeds sprout for a new crop come harvest time. Note that you can bury the pumpkin if there are concerns about attracting unwanted animals. You can also allow the pumpkin to decompose in the classroom in a clear container, such as an aquarium tank. Add some soil from outside as well as leaf litter to the bottom before adding the pumpkin to ensure a population of micro-organisms that will help decompose the gourd. Also, keep the contents of the tank moist and the container covered. Students can try this activity at home with their own Jack-o-Lanterns and painted pumpkins. Composting is the breaking down of organic material (anything that once lived) in a pile like the one Daisy keeps near her garden. You can compost food scraps outdoors in a designated section near the school garden. Bugs big and small, including worms, centipedes, and pill bugs, along with microscopic bacteria will soon be hard at work decomposing the material. After some time, what you are left with is called compost, or humus, a soil-like substance that can be added as fertilizer to garden soil or even to houseplants. As composting has become more accessible and popular around the country, it’s likely your students may already know something about it. They may also hold on to some misconceptions. It’s gross! It’s smelly! But when done correctly, composting is neither gross nor smelly. For more on how to compost, the Environmental Protection Agency offers a thorough resource guide. A compost also doesn’t require a large backyard. You can make small classroom-sized composters following this Nature Cat DIY and add pieces of the pumpkin, along with some natural materials from outside. When the material in your compost container looks like soil, you can add it to classroom plants or to a school garden. Note that this assumes a pumpkin is painted with non-toxic paint. Otherwise, you shouldn’t add it to your compost. Consider using your pumpkin as a springboard for a civics lesson and classroom action. Challenge your students to find out what happens to this Halloween’s pumpkins. If the landfill is their destination, ask students what they think should happen to the pumpkins instead. Local farms, municipal compost facilities or a school composting initiative may all be possibilities that students can suggest. You might even help them make posters to get others involved, and approach your school’s administration. 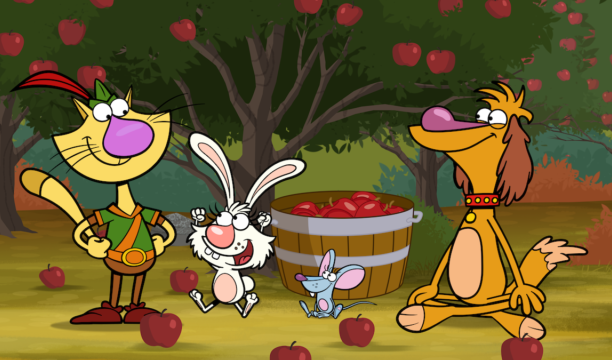 Nature Cat, Daisy, Squeeks and Hal host a Halloween Pumpkin After Party to show the other contestants what to do with their “retired” pumpkins. They turn the pumpkins into food, bird feeders and, of course, next year’s pumpkins by letting them decompose in Daisy’s garden. Combine your pumpkin fun with your students’ developing math skills: weigh them, measure their circumferences, or order them by size. Not to mention the wealth of language and visual arts projects with which you are all familiar! Make a pumpkin bird feeder. Instructions here from Audubon. Frances Nankin is an award-winning editor, writer and television/Web producer with more than 35 years experience developing content for children’s educational media. Prior to her current role as Content Producer for NATURE CAT with Spiffy Entertainment, she was Executive Producer/Editorial Director for the CYBERCHASE series with Thirteen/WNET, New York. Before that, she was Co-director of Science Content for THE MAGIC SCHOOL BUS TV series with Scholastic Productions. Nankin, a self-taught naturalist who grew up in the Ramapo Mountains of New York, is the author of several science-related books for children, and was the founding editor of a number of children’s magazines, including COBBLESTONE, a history magazine now in its 39th year of publication. Jesse McMahon, Content Producer for Nature Cat, holds a master’s degree in journalism, and brings to the team more than a decade of experience in research and writing in print media and educational publishing. She telecommutes from Maine, where she lives with her husband, two dogs and numerous chickens. McMahon's other TV credits include Content Brief Writer for Cyberchase and Science Consultant for Magic School Bus Rides Again. McMahon's byline has also appeared in numerous publications, including The Boston Globe, ProPublica and the Investigative Reporting Initiative at Northeastern University. Her commitment to volunteer work in environmental advocacy and deep respect for the natural world is a passion she is delighted to transfer to young viewers.